These super bright LED fairy lights can be safely used indoor and outdoor. They remain cool to the touch when lit and withstand most wind and rain. These 300LED warm white fairy lights include 24V BS plug transformer, IP44 8 function memory controller, 20m approx light length, 25m total cable length (clear cable). This is new improved model with memory hold function. Remember your flashing sequence set-up even power off. These white LED fairy lights are probably the best you can buy. These look fantastic LED's are 3 times as bright as normal bulbs, and they will last 10 times as long (25,000 hour average bulb life). In addition they will save you 90% on electricity compared to traditional fairy lights. Celebrate Christmas day or any special event with lights is happiness. These popular lights combine the new technology LED (Light Emitting Diode) with the entertainment pleasure, letting you relaxing and enjoying the sparkling lights while saving electricity. These gorgeous fairy lights are an ideal way to decorate your pergola, hang them from your gutters, put them on your hedge, or tree, or decorate at commercial place. 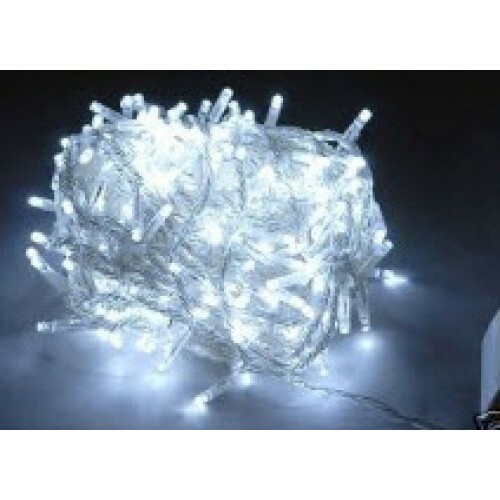 25M 300 LED White Fairy Lights with 8 Functions & Memory (Clear Cable) These super bright LED f..
21M 200 LED Warm White Fairy Lights with 8 Functions & Memory (Clear Cable) These warm white LE..
15.5M 100 LED Fairy Light White (Clear Cable) These super bright LED fairy lights can be safely use..
Meteor / Melting Icicle Lights 8 Tube 50cm 240 LED Christmas lights Australian Approved - WHITE ..
29M 300 LED Fairy Light Blue (Clear Cable) These super bright LED fairy lights can be safely used i..